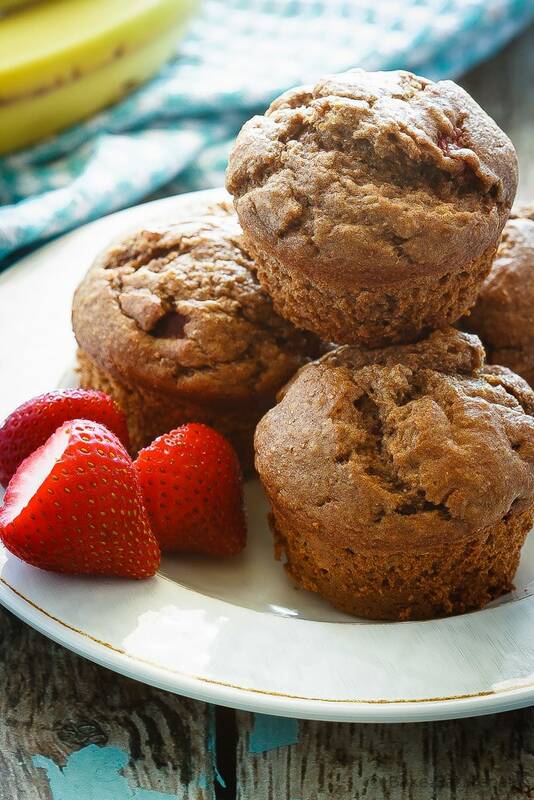 These whole wheat strawberry banana muffins are easy to make, light and fluffy muffins that are a healthy choice for breakfast or a snack! Well, after a super long Christmas break (how is it the middle of January already?!) I’m finally back with a new recipe for you. Except that it’s not. New, that is. Although I suppose I’m not really that sorry, because I’m guessing most of the people currently reading this have never actually seen this amazing muffin recipe hidden deep in the archives, with some truly horrible pictures that would likely prevent anyone from actually trying it. Which is sad, because these strawberry banana muffins are amazing. One hundred percent whole wheat, but they don’t taste like it. Low sugar, low fat, one bowl, mix up in minutes, amazing. I found this recipe years ago, and have made it more times then I can count since then, adapting it to suit our tastes. It’s the recipe I always pull out when I have some bananas ready to bake with sitting on the counter. 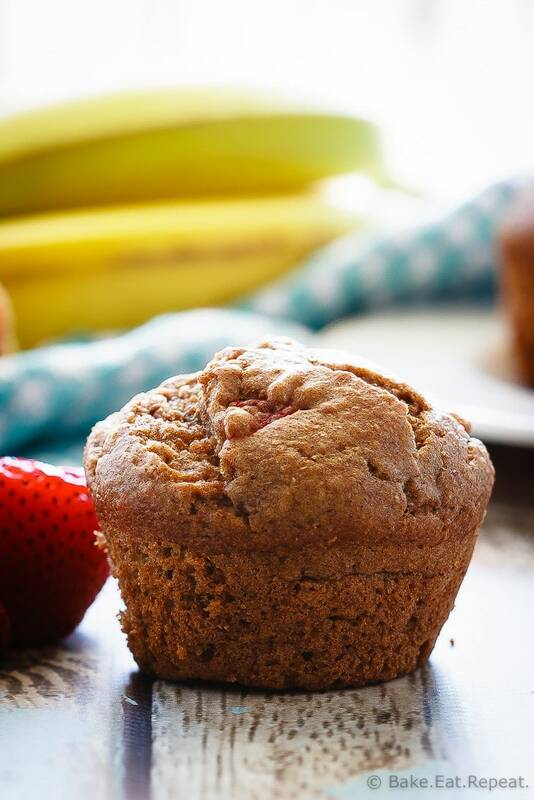 These whole wheat strawberry banana muffins make the perfect breakfast or snack, plus they freeze well. I love having a batch of these in the freezer for quick grab and go breakfasts, or to throw at the kids as they’re heading out to their various sports in the evenings. I also love how adaptable this recipe is. Make them with all purpose flour if you don’t have whole wheat, make them a bit sweeter if you like, use apple sauce instead of yogurt if that’s what you have, change up the berries to whatever you have on hand (or use chocolate chips – that would be awesome, although it would negate the “healthy” part) – so many options. And I have probably tried them all. This is literally my favourite muffin recipe. So bringing it back into the spotlight was clearly the way to start the New Year. 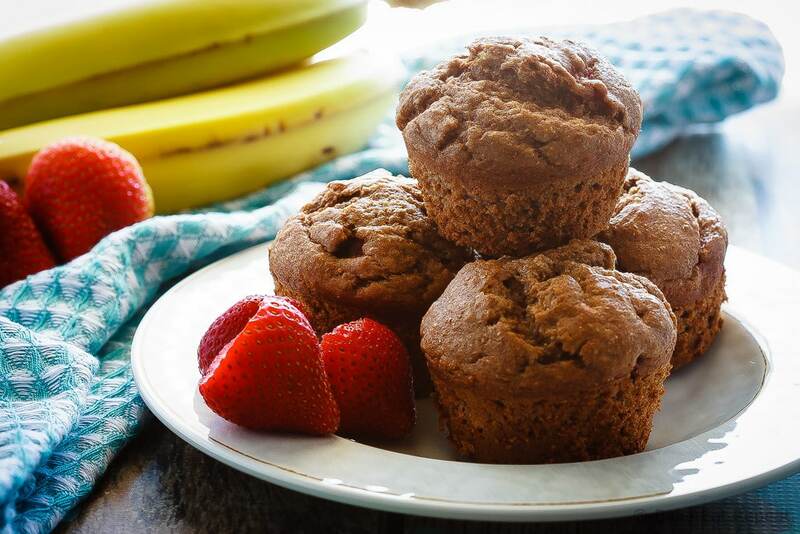 If you’re looking for a healthy breakfast idea, try out these whole wheat strawberry banana muffins – you’ll love them! Preheat the oven to 375 degrees F. Spray a muffin pan with non-stick spray or line with paper liners. In a large bowl, whisk together the eggs, yogurt, oil, brown sugar, vanilla and bananas. Add the flour, baking soda and cinnamon and mix until just combined. Fold in the strawberries. Divide batter between the 12 muffin cups, they will be almost full. Bake for 20 minutes or until a toothpick inserted into the centre comes out clean. Cool completely before removing from the muffin tin. I've used both plain regular and Greek yogurt as well as substituting unsweetened applesauce for the yogurt with good results. You can also increase the brown sugar to 1/2 cup, but I find that the bananas and berries give these muffins enough sweetness and it's not needed. If you like a sweeter muffin then increase the sugar a bit. I've used frozen and fresh berries and both work well. I've also made them blending the wet ingredients before adding in the dry for a smoother batter, if you have kids like mine that don't like any chunks of banana visible in their muffins! Source: Adapted from Allrecipes .